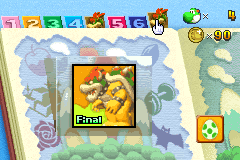 The Tale of Bowser's Cave is the final chapter in Yoshi Topsy-Turvy and is a boss battle against Bowser. Before it begins, the Spirit Who Loves Surprises congratulates Yoshi on making it to this chapter and tells him that Bowser is just up ahead. Yoshi battling Bowser in the first area. This is the only mission in this chapter. During the fight, Bowser will release his Fire Breath, which will deal a few points of damage towards Yoshi. The fight starts on an orange cardboard area in a gloomy purple area with some blue objects in the background. The player can cause damage towards Bowser by rolling a bomb into him and having it explode, which will cause him to fall back. When he lands after falling backwards he causes a few Shy Guys to fall from the top of the screen, which will roll on the ground after they land. After Yoshi hits Bowser with three bombs, Bowser and Yoshi will jump down to the next area. This area is similar to the first, but the background looks more pink. The other Yoshi Island Spirits in the ending cutscene. The bombs here are on parachutes, so the player must tilt the console to have them land on Bowser. When falling backwards after being hit by a bomb in this area, he will spawn three Rainbow Tap-Taps, which is their only appearance in the game. After Yoshi hits Bowser with three more bombs, the battle moves into a small room with lava on the bottom. Bowser will land on a small platform trying to balance on it with one foot. The player must tilt their Game Boy Advance console so that Bowser will lose his balance and fall into the lava. After this, he will launch upwards and the mission will be completed. A cutscene plays of Bowser falling into a void followed by all the other Yoshi Island Spirits congratulating Yoshi on defeating Bowser. Hongo will then turn Yoshi's Island back to normal followed by the credits. This page was last edited on November 13, 2018, at 23:21.